Nimmi Attack Soumya! 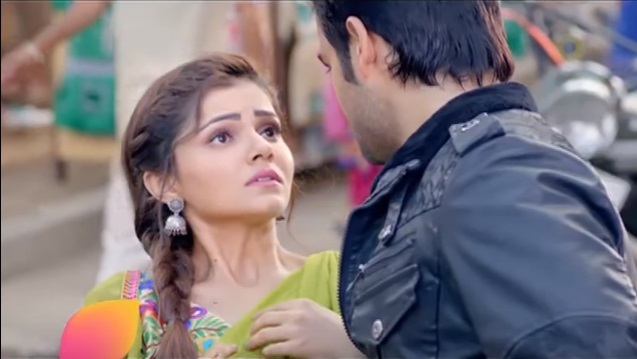 Shakti Astitva Ke Ehsaas Ki 19th July 2016 Episode Written Updates :- The TV series Shakti-Astitva Ke Ehsaas Ki this time showcase story in which Harman marries Soumya and she is having already poisoned. So actually Harman already took Saat Pheras with poisonous Soumya as due to her dad Maninder and Bee Ji give her poison and she was faint. There were a lot of drama in which it is shown last night episode on the nuptials ceremony take place amongst many twists and turns. Maninder (Ayub Khan) tells Bejee that this wedding will ruin their reputation and the whole Pind will go against them. So Maninder plans to feed her poisoned. Beejee feeds poisoned Kheer to Soumya on her wedding. She happily eats it thinking that her family loves her at last. Slowly, she will start feeling weak. Harman will hold her. When she falls unconscious, he will take her in his arms and complete the Saat Pheras. Harman will be worried and rush Soumya to the doctors. We will see her safe as on the right time Harman will be calling doctor and doctor will be asked that she is okay. So eventually after treatment Saumya will be alright. So due to the wedding did both Nimmi and Khadhak Singh are happy but Preeto and Maninder are not happy with the wedding and Maninder is looking forward to having a way by which he can hide the secret of Saumya as if it will disclose then it can hamper his family’s identification and prestige. So second time now Man insider will try to kill Saumya by doing emotional drama and then Maninder gives a gift to Saumya and asks her to open it when she is alone. Saumya is very happy to get a gift from her father. Meanwhile, Nimmi is very sad at the time of Saumya’s Bidaai and actually Maninder kept a snake in the box by which Maninder thinks that Saumya will die with that. Now the crux of the story is how Saumya will be deal with the same.